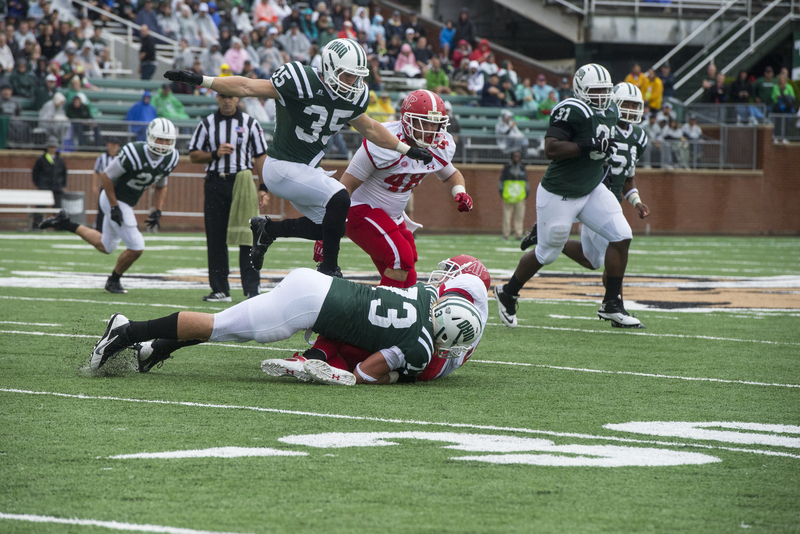 The third-down dominance by the Ohio Bobcats (3-1) this season continued to pester opponents at Peden Stadium on a water-logged Saturday when the Austin Peay Governors (0-4) came to town for the Parent’s Weekend matchup. Just when Austin Peay thought that they had the Bobcat offense by their tails, quarterback Tyler Tettleton and company operated their way out of multiple trenches by putting points on the scoreboard. On the ‘Cats’ initial drive of the contest, Tettleton hooked up with wide receiver Matt Waters for the six-yard score on third-and-goal for his first career touchdown. All three of Tettleton’s first-half touchdown passes came with the Bobcats facing a third down of six yards or longer, and the team finished the day converting 61.5 percent of their third-down attempts. Ohio’s success in this department, coupled with a stout defensive effort, defined a stalwart shut-out victory over their FCS counterparts. “Every little tidbit that (wide receiver coach Dwayne Dixon) tells me I take to heart and I try to implement into my game,” Waters said of the team’s effort on Saturday. While the offense made it their mission to tire out the undersized and less athletic Austin Peay defense, the Green and White used patience on the other side of the ball to control the Governors’ transitioning offense. Linebacker Nieco Teipel applied this mantra to record his first sack on Austin Peay quarterback Andrew Spivey, forcing the opponents to their second three-and-out. The defense ended up preventing an Austin Peay third-down conversion and first down until the 12-minute mark of the second quarter, a defining reason why Ohio was able to keep the Governors off the scoreboard for 60 minutes. “There’s nobody that doesn’t have a group of athletes that’s capable of getting things done, so to shut a team out is no easy task,” head coach Fank Solich said. Despite faltering on its second offensive drive, Ohio opened the playbook with the passing game on the team’s third – and at 78 yards, longest – on the day. Miscommunication allowed wide out Donte Foster to break away on the right side for an uncontested 53-yard touchdown to put the score at 14-0 near the end of the first quarter. Tettleton finished his third-down scoring trifecta in the first half with his second touchdown pass to Waters, a 23-yard strike on third-down-and-22 to extend the Bobcats’ lead to 21-0 at the beginning of the second frame. Up three scores and holding the Governors to 114 yards of total offense in the first half prompted head coach Frank Solich to send in quarterback Derrius Vick and all available reserve players around the time the third quarter got underway. “We got everybody in today that is not red-shirting or is eligible, s everybody played that we could put on the field,” Solich stated. Mental errors, which included nine penalties and 12 failed third-down conversions, prevented Austin Peay from building a comeback in the second half. The Governors running game — powered by Omar Williams who rushed for 108 yards — shed some light on an otherwise miserable game for Austin Peay, but the Govs couldn’t make good on any of their four red zone tries. The red bricks that usually line the streets of Athens seemed to represent the mentality of the Bobcat defense that came out with a “bend but don’t break” attitude. A front seven unit that lost four seniors to graduation last season has now developed into one of the team’s brightest spot throughout the past three victories. “Coach (Jesse) Williams has been real hard on us by making sure we’re grinding hard everyday and making sure we’re not the ones out there making mistakes,” defensive end Ty Branz said. Sophomore running back Daz’mond Patterson was a shining example on Saturday of a Bobcat who took full advantage of the opportunities presented in front of him. On Solich’s gutsiest call of the day, Patterson took a double reverse around the left side for a 32-yard gain. Patterson’s athleticism set up a one-yard touchdown run by Ryan Boykin and also helped him land score of his own in the final quarter of play. The determined back tolerantly hit his holes, which eventually led to a 13-yard score to extend the lead to 38-0. “It feels to good to be able to get into the game when coach has something specifically planned for you,” Patterson said of his play at the slot position. When Solich, Tettleton and the Ohio leaders announced that the pounding they took at Louisville would be either forgotten or used as motivation moving forward, it was hard to believe at the time. Now, after two hard-fought wins and a dominant victory, it seems as if the Bobcat players have all but forgotten what happened on that Sunday in Louisville. “We don’t have the type of people on our team that are going to get down and give up on the season because we lost one game,” Patterson boldly proclaimed. The Bobcats will have a weekend off from football next Saturday with a bye week heading into MAC action. Ohio will hit the road after a three-game home stand on Oct. 5 when they face off against the Akron Zips (1-2, 0-0). Kickoff is set for 1 p.m. at InfoCision Stadium. 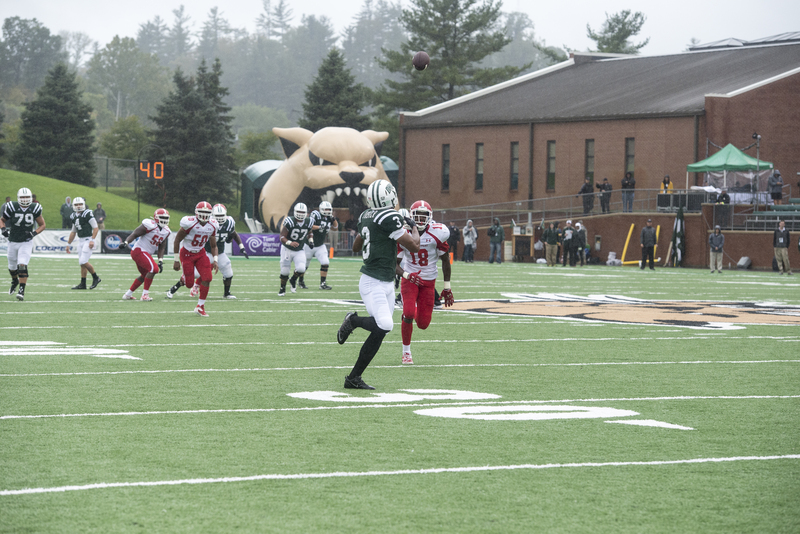 Solich recorded his first shutout victory as a head coach of the Ohio Bobcats on Saturday. Patterson became the closest Ohio back to eclipsing 100 yards on the season against the Governors, carrying the ball seven times for 94 yards and one touchdown. Tettleton only missed on two passes, going 13-of-15 for 213 yards and three TDs. Safety Travis Carrie struggled in the punt return game Saturday, returning only five kicks for nine yards. Kicker Josiah Yazdani converted on his first field goal of 47 yards in the fourth quarter. Ohio put the ball on the ground a lot in wet conditions, losing three of four fumbles.